JP 2007-01-30 600 points ? EU 2007-01-26 600 points ? JP (Download) 2010-02-17 ¥? ? US (Download) 2011-06-07 $? ? 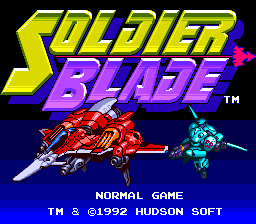 Soldier Blade (ソルジャーブレイド) is a shoot-'em-up developed and published by Hudson Soft for the PC Engine and TurboGrafx-16, and is the sequel to Final Soldier. It was also released as a downloadable emulated game on the Wii and Wii U Virtual Consoles, and the PlayStation 3. Main article: Soldier Blade/Magazine articles. This page was last modified on 23 December 2018, at 08:32.